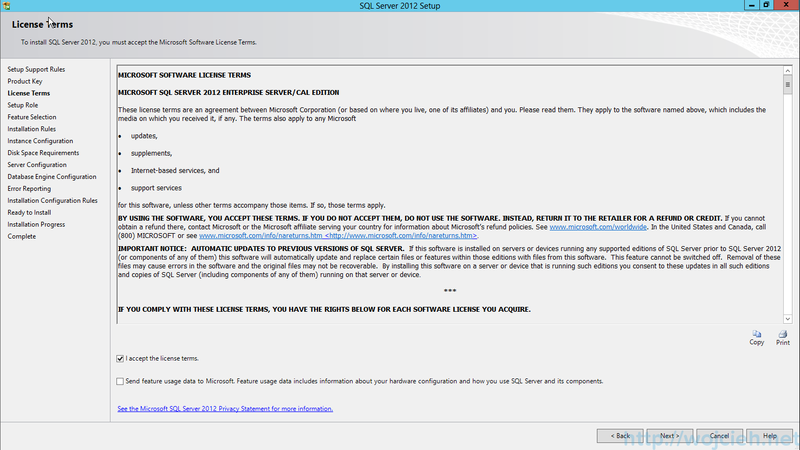 In the first post, I will show you how to install Microsoft SQL Server 2012 to use it by vCenter Server 5.5 on Windows Server 2012. 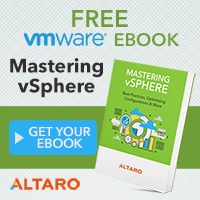 Next posts will cover Databases preparation and vCenter Server 5.5 installation. 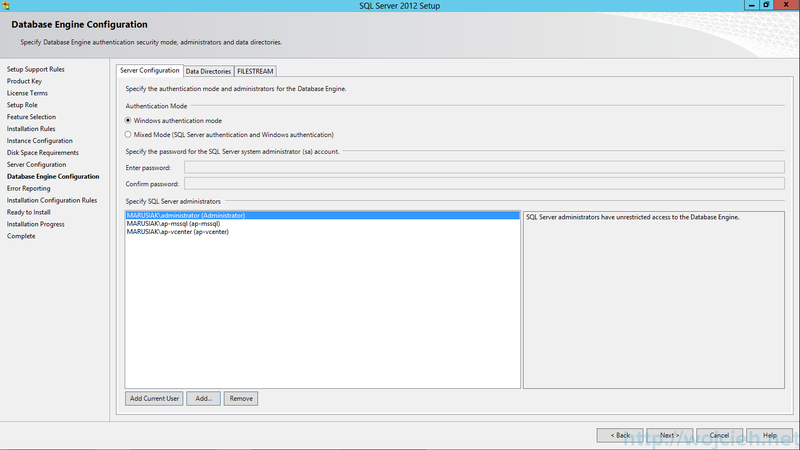 Before you actually launch SQL Server installation I recommend to run System Configuration Checker. 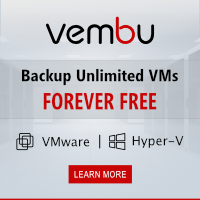 This tool might really save your time when your installation will fail or you will have problems. In my case, it was all ok. 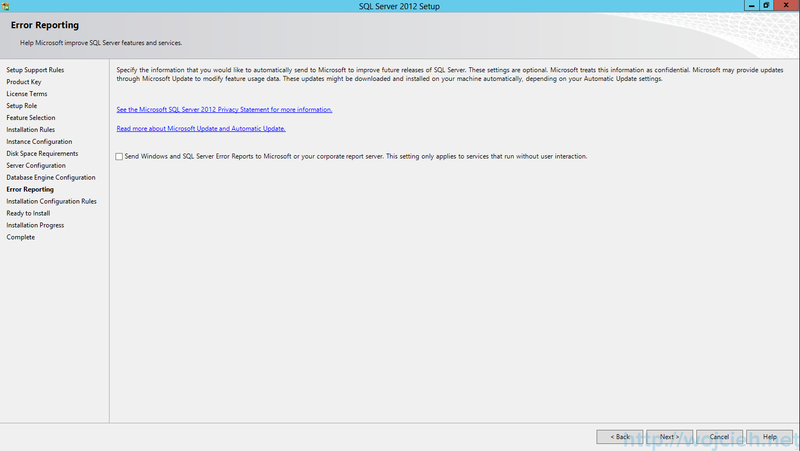 Installation of SQL Server is really not difficult (almost like 95% of Windows software – Next, Next, Next) and it has only FOUR steps. 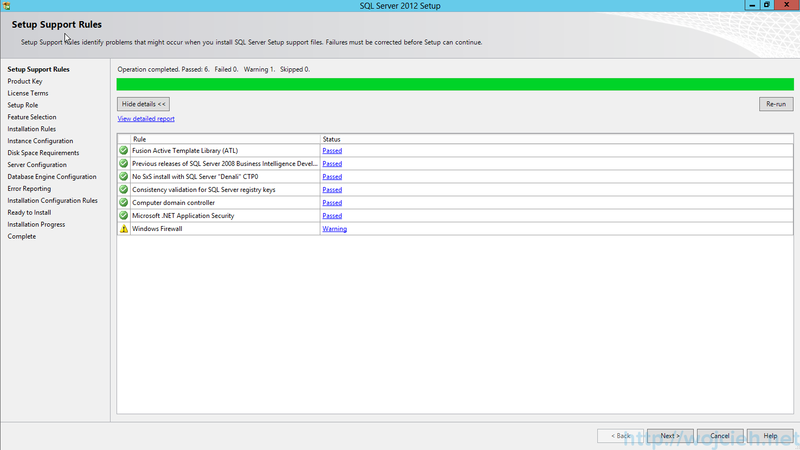 Next step is SQL Server Role Setup which is a bit more complicated. 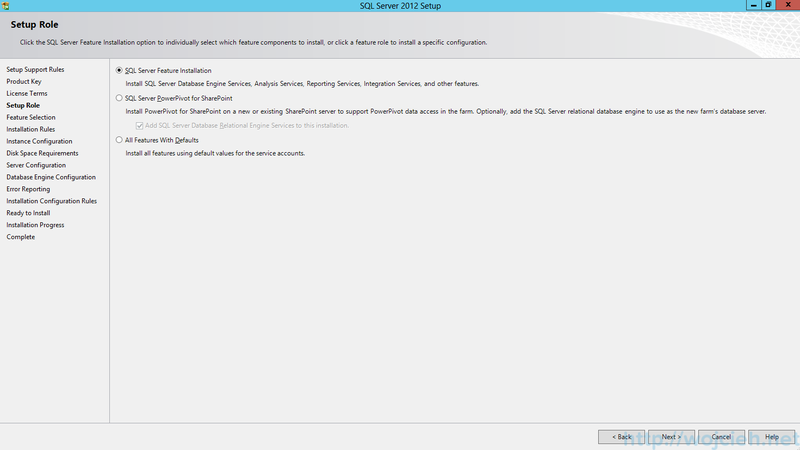 I ran into an error during SQL Server 2012 SP1 installation. When you selected desired/required for vCenter Server SQL Server Features setup will finish but you will receive an error that Windows feature NetFx3 was not enabled. 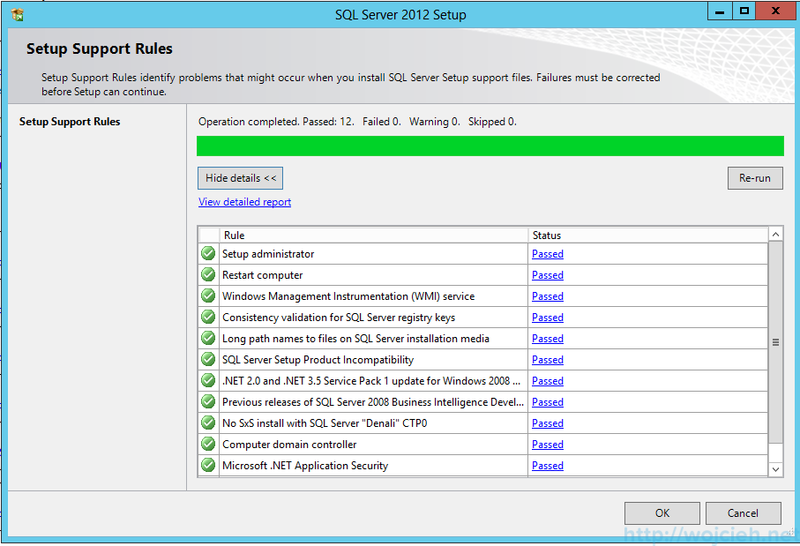 It happened 1 out of 3 SQL Server installations but it is good to know how to fix it. On blog http://garvis.ca/2013/01/04/installing-netfx3-on-windows-server-2012/ it is explained how to fix. 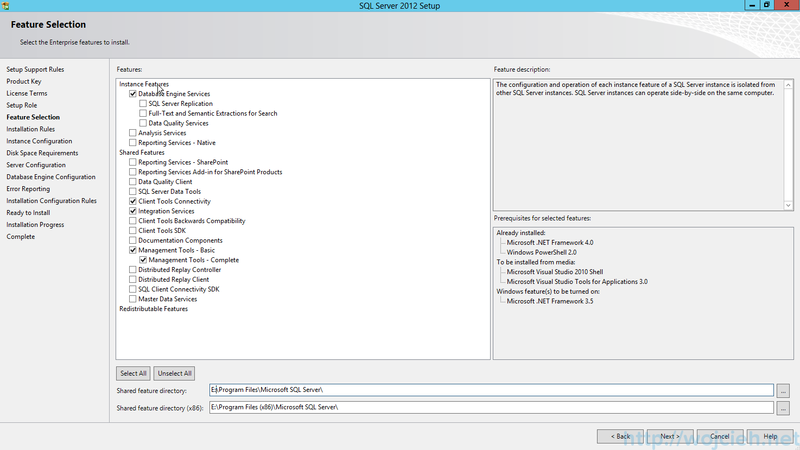 In this section, we will go through the process of SQL Server installation. 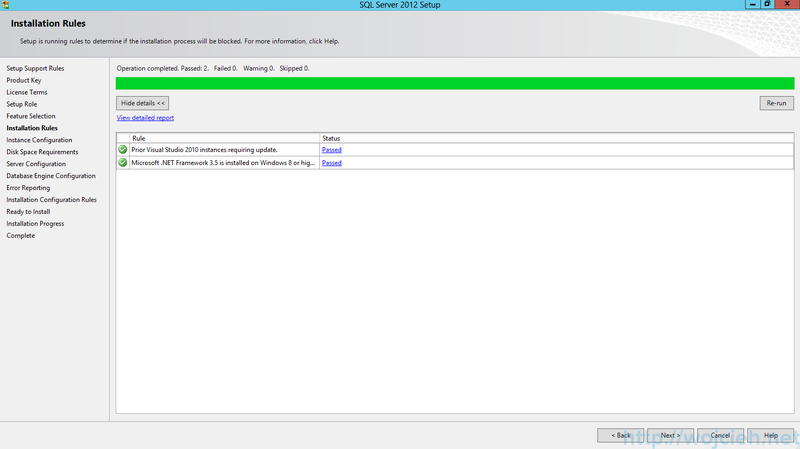 You can change as well directories where SQL are installed. I selected another drive to avoid filling OS partition. Installation Rules – just click next. 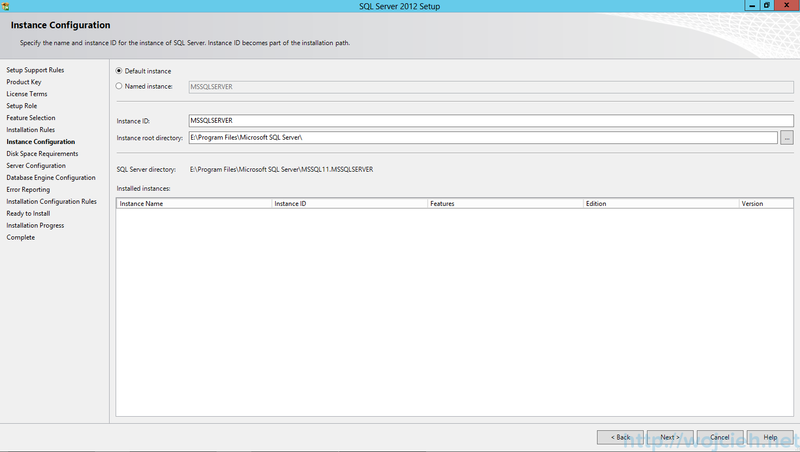 Instance Configuration – here you can change SQL Server instance name and instance directory. Again I changed it to a different drive. Server Configuration – as I wrote at the beginning, I created a dedicated SQL domain user with strong password which will not expire. I set all services to automatic start. 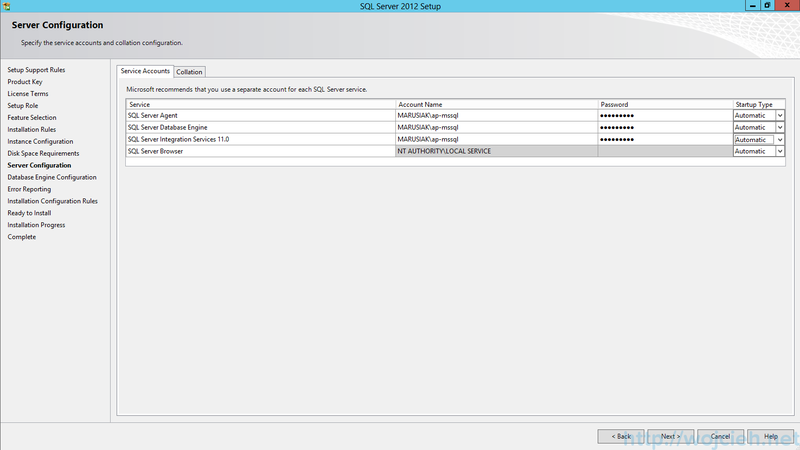 Database Engine Configuration – in this section I added mssql, vcenter, and my current account as SQL Administrators. I used Windows Authentication mode. 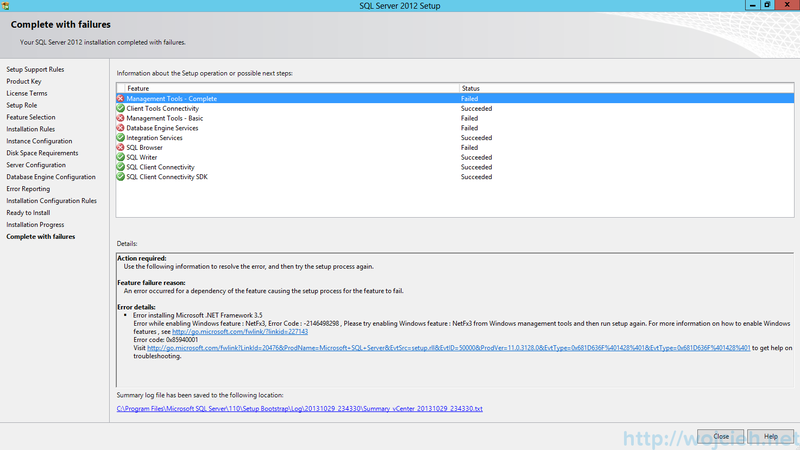 In second post https://www.wojcieh.net/vcenter-server-5-5-on-sql-server-2012-installation-part-2/ I described next steps to install vCenter Server 5.5. You don’t mention anything about Collation ! Can this still be an issue ? 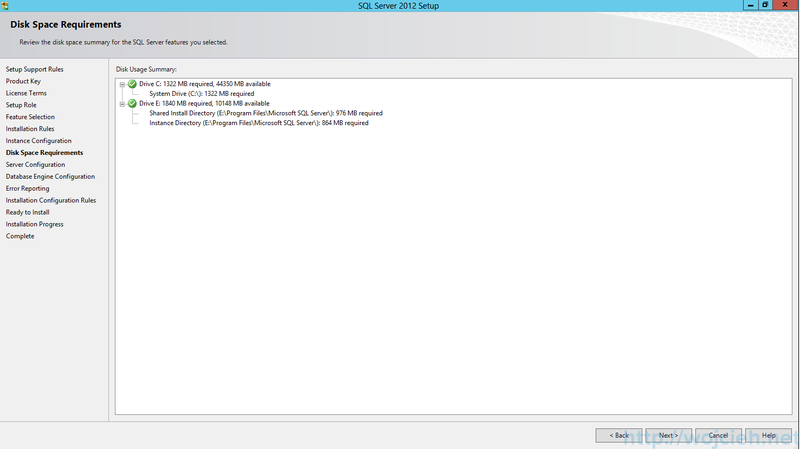 In second post http://wojcieh.net/vcenter-server-5-5-on-sql-server-2012-installation-part-2/ I used VMware script to create Database. VMware script use SQL_Latin1_General_CP1_CI_AS and I didn’t change it. Did you encountered problem due to wrong collation settings in past? 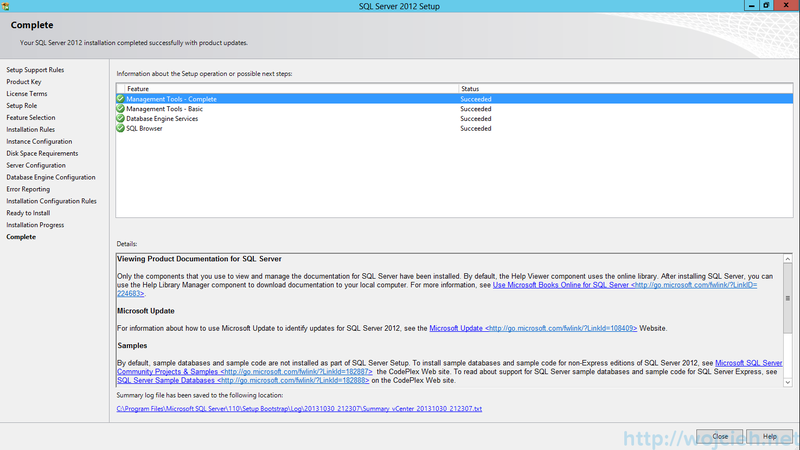 What about Compatibility vsphere 5.1.up1 and MS SQL 2012 Express ?? I will try to install it this evening in my lab. I will let you know how it went. Your post is very helpful for neophyte like me. 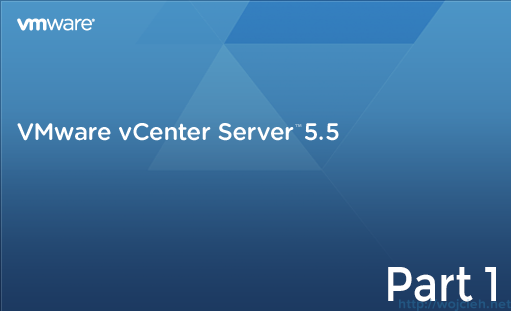 Do you have related post for vCenter upgrade from 5.1 to 5.5 in Windows 2008 R2 env? Anticipating with thanks for your time and effort. 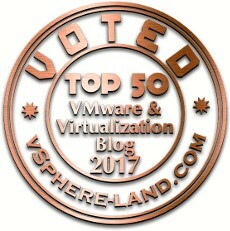 I don’t have it but I intend to create series of post explaining how to upgrade from vSphere 5.1 to 5.5. Stay tuned! Step 10. “Data Directories” tab. Hi there, nice post, however, the installation hangs after entering domain accounts, and I see that this is a known bug but I haven’t seen any solution for this other than “use the default accounts and change them later” which I find to be a bit inconvenient since it defeats my ultimate goal, a fully unattended installation..
Did you experience this issue when entering your domain accounts? 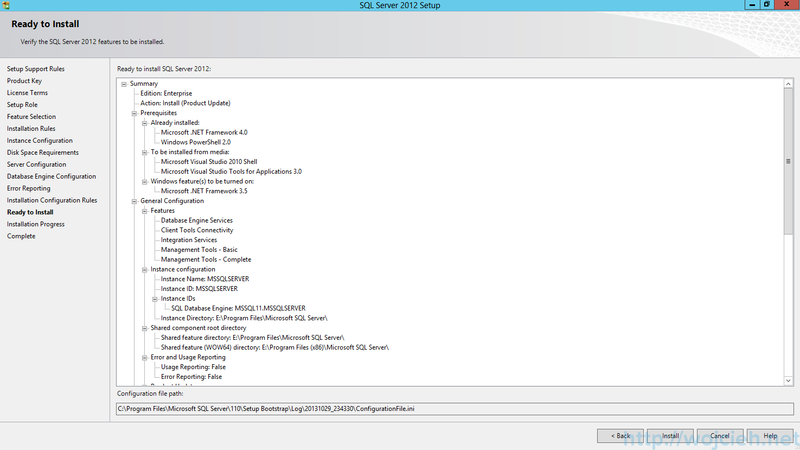 and if not, do you have any insight into what the issue is with sql 2012 hanging at the server configuration screen? Thank you so much for these tutorials but I have one question please. I am unable to locate any mention at the beginning of this document about creating an SQL domian user. Could you please clarify or provide a link to domain users you created in order to complete these tutorials. Thank you so much for your help.